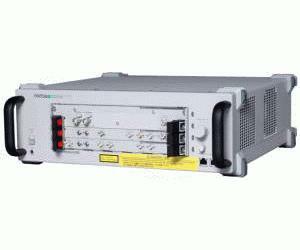 The MP1800 Signal Quality Analyzer (SQA) is a measuring instrument that provides bit error rate and quality analysis for digital signals from 100 Mbit/s up to 12.5 Gbit/s. The modular design of the MP1800A Signal Quality Analyzer (SQA) series offers customers a flexible cost-effective solution for performing measurements at the ideal bit error rate. The MP1800 SQA provides both Pulse Pattern Generator (PPG) and Error Detector (ED) in a single chassis. It allows for multi-channel support for parallel testing. Complicated searching for input thresholds or phase adjustments is simplified with the touch of a single key. It is ideal for research and development of high-speed logic, ICs, digital systems, FTTx, and PON.